This article is about the place in Japan. For the place in People's Republic of China, see Sanya. For other uses, see Sanya (disambiguation). 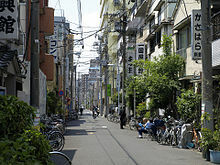 San'ya (山谷, San'ya) is an area in the Taitō and Arakawa wards of Tokyo, located south of the Namidabashi intersection, around the Yoshino-dori. A neighborhood named "San'ya" existed until 1966, but the area was renamed and split between several neighborhoods. It is a region with a distinct culture, an area of crowded, cheap rooming houses where day laborers live. San'ya dates to the Edo period. Lower caste workers, butchers, tanners, leatherworkers, and the like, were forced to live in this undesirable region by the predominantly Buddhist authorities. It has retained its association with both lower class workers and with craftsmen. Within the past few years gentrification has begun to encroach on the area. In recent years, some of the rooming houses have converted to provide cheap accommodation for foreign backpackers. Since the Edo period, Kichinyado (木賃宿, a type of cheap lodging house that does not serve meals) have been located along the sides of the Ōshū Kaidō and the Nikkō Kaidō routes (two of the five main Edo period routes). To this day, there are many of these simple lodging establishments in areas where day laborers assemble. Throughout Japan, these lodging establishments are called “doya"(ja:ドヤ街). Prior to 1966, the address of this area was Taito-Ward, Asakusa, Sanya 1~4 Chome, but due to a government program enforcing the renaming of displayed address across Japan, the name “Sanya” faded away. Namidabashi (on the borderline of current day Taito-Ward and Arakawa-Ward) is on the boundary of former Edo, nearby there were areas such as an execution site and a temple where the corpses of prostitutes were thrown. Still, in the neighborhood of the southwestern part of Sanya, there is a soapland district formerly known as Yoshiwara (this name also faded away due the government’s address renaming programming in 1966. The area is now known as Taito-Ward, Senzoku – 1 Bureau). The working conditions of the day laborers of Sanya are substandard, and many fall prey to the yakuza crime syndicate. In reaction, anti-war and anti-emperor system billboards and signs can also be seen in the district. Catholic and Protestant churches and other organizations took root in Sanya, and in cooperation, provide emergency food and other humanitarian services. Most of the simple-lodging establishments provide only a place where one can sleep (things such as food services are not provided). Inside, the lodging facilities can vary; dormitory style rooms for eight people are even offered. Also, on the front of many of these lodgings, signs with promotional phrases such as “Color TV in Every Room,” “Air Conditioned and Heated Rooms” are hung. Although this trivial formality may vary lodging to lodging, with the exception of newly constructed simple-lodging establishments, these two phrases are almost always present. Since the 2002 FIFA World Cup, foreign tourists have started using cheap lodging in Sanya (mainly in Senjuu). Foreign customers are increasing due to the fact that prices are inexpensive, there is decent public order (to the degree that drunken fights between friends resulting in injury, shop lifting, and about five murder cases per year), and from the nearest station, the Minami Senju Subway Station, via the Hibya Line, you can go to Ueno, Akihabara, Ginza, Roppongi and other sightseeing spots. Moreover, because of the increasing interactions with foreigners, Sanya’s former image is being transformed and “a cheap hotel town for foreigners” image is being established. On October 3, 2008, after the arson incident on the Minami adult video store in Osaka, the prefectural governor or Tokyo, Ishihara Shintaro, made the following comment concerning lodging establishments in Sanya and the people displaced from the fire, “If you go to Sanya, there are plenty of places you can stay for 200 or 300 yen, but in fashion, while you stay over at a 1500 yen a night place, you say things like, “This is dreadful.”” In regards to this statement, the Chief of Taito-Ward protested, which led to Ishihara, in an interview on October 10, 2008 to correct his previous statement by saying “The numbers were a little off.” As of 2008, places where you can stay for 200 or 300 yen do not exist. Originally, the area was the first inn town in the direction of Edo on the Nikkoukaidou Highway. From the early days of the Meiji Era, it was the government’s intention to form the cheap housing district in the outskirts of the city near the highway in order to have a place for rickshaw workers who shuttled customers to and from the Yoshiwara Red Light District to live. By the pre-war days, there was already a largely poor class, such as day laborers, residing in the area. After the war, temporary lodging (tent village) were prepared for the war victims, however these were changed into the permanent simple-lodging establishments that are seen today. Before long, the period of rapid economic growth experienced in Japan after WWII arrived, and in order to cope with the upsurge in the demand for workers, Japan’s more prominent location for temporary workers, Sanya, was developed. By 1961, the 300 simple-lodging establishments had been built in Sanya were housing approximately 20,000 workers. During the 1960s, due to the many riots with participants numbering in the thousands, this area had to establish the Sanya-District Police Station (once popularly called “Mammoth Station”, is now currently renamed to Nihon-Tsutsumi Police Station). Many reasons have surfaced regarding the direct origin of the riots, but one theory points to abetment from criminals and radical party extremists. In 1969, the folk singer, Okabayashi, debuted, “Sanya Blues,” a song about the grief of day laborers. It is said that Okabayashi manufactured the image of his lengthy stint in Sanya, when in fact his stay was to the extent of one week. In the year 1984 and 1988, the successive assassinations occurred of two people producing the documentary “Sanya – Attack to Attack,” a film which paints the conflicts of the day laborers with the secret maneuvering of the Yakuza. The murder suspects are members of the “Kokusuikai” Yakusa Assembly. Accompanying such a change in residents, the simple-lodging establishments that existed traditionally for day laborers, are instead, increasingly being used as cheap hotels, due to foreigners from many countries coming to Japan for travel. Inside of the lodgings, information has come to be written in English, and the movement of owners promoting to foreign customers can be seen. Also brand new constructions of simple-lodging establishments are appearing one by one. Furthermore, in recent years, the case can be seen where during breaks, young people from inside and outside of Japan traveling to the city or coming for events use these simple-lodging establishments. Chuon-Ward – “Sanya River Bank” is located in the present day town of Nihonbashi. Also, there is the “Sanya Canal” which can be passed while going the Yoshiwara Red Light District from the “Sanya Boat,” a shipping agency. Shibuya-Ward – In the current Yoyogi district, there is a “Sanya Elementary School”. "Mysterious Past Meets Uncertain Future in Tokyo's Sanya District". Digital Journal, October 31, 2009. Blair McBride on Buraku status of North-East Tokyo area.